Inspiration. For me, that is what this weekend was all about. This was the 4th annual Sunshine Coast Art Crawl. 122 studios and galleries representing over 300 artists who opened their studios (and many their homes) for everyone to come and see. The crawl stretches the entire Sunshine Coast, literally from Langdale to Lund. It involves every kind of visual artistry you can think of…painters, sculptors, potters, weavers, glass blowers, blacksmiths, photographers, carvers, woodworkers, fibre artists, and even a chocolatier. It is an amazing group of talent…many artists who are quite famous and some who are just getting started and building confidence. They all open their doors for one weekend and invite us to experience a bit of their work. I really don’t know anything about art. No education…no artistic talent myself….but I know when I see something that amazes me…makes me feel inspired. That is what I take most from this weekend. Who inspired me most? Let’s start with Marleen & Marlene…my incredibly talented friends and neighbors. Marleen Vermeulen captures the beauty of our west coast surroundings in her life-size oil paintings. She is at home hiking in the forest and you can just reach out and touch the trees, the beach and the water in her paintings. They are thick with texture…a trowel is her tool as much as paintbrush…and fully capture changing light. Marlene Lowden paints abstracts full of life and love and blends her yogi spirit into her art. Everything is in balance. Everything is at peace. Quotes of inspiration line the walls alongside the paintings. I was completely taken aback by the Watercolour Journey of Hiroshi Shimizaki. He has literally traveled the world and has been capturing it in watercolours along the way. He is a geographer (a man after my own heart) and with his paintings, he took us on a world tour through his home and gallery. Every room a different continent. Famous places and unknown places…all captured beautifully in simple yet elaborate watercolours. I was reminded how important it is to see the world and experience many different cultures. We only understand and appreciate fully when we travel and experience first hand the simple aspects of sharing a meal and talking with people. George Pratt is an exceptionally talented sculptor who clearly loves animals and nature. Amazing works of granite and marble and I’m sure many other types of rock alongside wood and paintings. Life-size works like these lined the driveway and many more small pieces were found inside his studio. He invites you to touch and feel the art…many smooth as silk spinning on glass, others rough and textured with their own stories. The other thing I love about Art Crawl weekend is that you have to get out and explore. This isn’t walking down a city street to visit neighboring galleries. These artists have made their homes in the rural communities of the Sunshine Coast and most of their studios are a part of their homes. To Crawl the Coast is to walk along the waterfront…to climb steep hills…to drive down single lane gravel roads into the forest. You think you’ve gone to the end of the road…and then it turns and just keeps going. You visit neighborhoods that you didn’t know existed. You get the chance to see natural beauty that you don’t take time for on a regular day. I can’t wait for next year! October 2014 Have a look at these Art Crawl videos to take a bit of inspiration for yourself. What a summer. Today was the last day of July and not a single drop of rain all month long. Nothing but sunshine and perfect temperatures to be outside on the ocean. Today I took advantage of one of my favourite summer programs: WOW – (Wednesdays on Water) coordinated by my friends at Alpha Adventures. I’ve paddled in a number of places on the Sunshine Coast, but I really enjoy the WOW SUP program. Every Wednesday evening a group paddle goes out of either Davis Bay or Porpoise Bay Provincial Park. I love the social aspect. It is always a different group of people at different levels of experience. The conversation is always different and interesting. Tonight there were 4 of us along with our high-energy leader, Sarah. A teenager and his dad, a very mature 12 year old boy, and myself. The others were new paddlers, but Sarah had them confidently stand up paddling in the bay in no time. I always enjoy paddling in Davis Bay. It faces west, so great sunset views and Vancouver Island is off in the distance. Cruise ships bound for Alaska sail past every evening, and we got to watch 2 of them tonight while we paddled. Davis Bay opens to the Salish Sea, a.k.a. Georgia Strait. A heron landed on the edge of the wood pilings shown above. It was so still, I thought it was a statue but soon enough it took off in flight skimming just above the water. Beautiful! Davis Bay is an active area where people come to swim, walk the long seawall, fish off the pier, or just watch the sunset. Tonight there were a group of about 10 who were jumping off the pier into the warm ocean. It wasn’t quite high tide yet, so they were jumping a good 10-15 feet into the water. Definitely braver than me, but fun to watch while I paddled. Let’s hope August is just as nice and provides many more days of fun on the ocean. The long sunny days of summer have truly arrived and I can think of no better way to celebrate than my first paddle of the season. I love paddleboarding! Today my hiking buddy and I spent the afternoon getting our workout in Gibsons Harbour. We couldn’t have asked for a better day…temps in the low 20’s (70’s F), sunshine and a light breeze on the ocean. Not a bad backdrop for a workout, is it? The only downside about paddling is that it is hard to take pictures to help convey the experience. I’m not nearly confident enough to take my non-waterproof camera out for a paddle. Here is a shot from last summer to help you get the idea. I take every opportunity to get out on the water. This prairie kid truly appreciates the magic of the ocean. I think what I love most is getting a different perspective on things. You see the landscape around you in a certain way every day…you think you know what your community looks like. Then you get out on the water and get the chance to look back at the landscape in the opposite direction. It is interesting how some things look very different when you can take a 180. I love the freedom of paddling. Don’t get me wrong…it’s a workout. Core body strength is important in keeping your balance, and your upper body conditioning is way more fun than lifting weights. But the freedom of being under your own power while gliding through the water…that is something special. You’re weightless…yet expending energy. You might work up a sweat…but all you have to do is jump in and cool off. I am very happy to have SUP’s available for rent now right here in Gibsons Landing. I’ve been out many times in Davis Bay and on Sechelt Inlet, but now I can go 5 minutes from my front door. The new owners of Sunshine Kayaking have added paddleboards to their fleet of kayak rentals. They have also added sailboat tours….can’t wait to try a sunset trip! Mark your calendars…next full moon paddle is July 22. Skookumchuck Narrows Provincial Park is a force of nature. Unfortunately for me, it is as far from Arcturus Retreat on the Sunshine Coast as you can go without getting on a ferry. [Map] It seems the only time we go is when we have family & friends from far away. I really enjoy this hike. It is easy terrain, the forest is abundant with life and there is an excellent reward at the end of the hike. Today was a misty/rainy morning, but we decided to make the best of it. 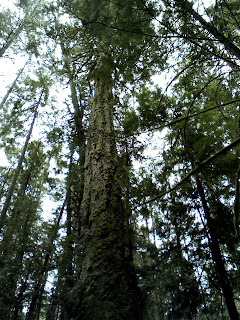 The forest canopy is thick enough to protect you from light rain and it stopped altogether midway into the trek. 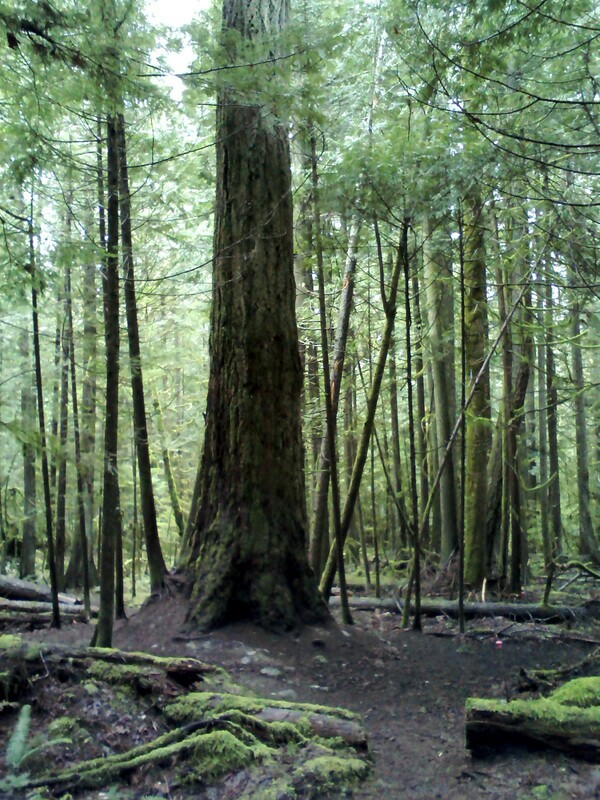 This trail showcases life in the BC rainforest. Ferns are found everywhere, and many are quite large. When it is dry, kids would love a game of hide & seek. Moss grows thick on trees and there were a number of large mushrooms along the trail. Most of this area was logged at the beginning of the 20th century, but the 2nd growth forest is vibrant and healthy. 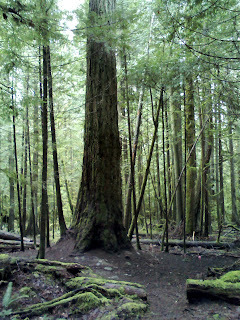 A few very large stumps remind you of what these trees can become if left to grow for hundreds of years. Skookumchuck is from a First Nation’s phrase meaning “strong water”, a fitting name for the home of the fastest tidal rapids in North America. Skookumchuck Narrows is a narrow space at the opening of Sechelt Inlet where it meets Jervis Inlet and the Pacific Ocean. As the tide comes in, the ocean is forced through the narrow opening at high speed. A very high tide will create current of more than 15 knots and result in standing waves for whitewater kayaking or even surfing. These are known as the Sechelt Rapids. As the tide goes out, the ocean is forced back out of the inlet to the ocean creating whirlpools strong enough to sink a boat. In between tide changes, the water can be as calm as glass. Always consult the tide schedule to time your visit. Today we caught a medium current. Not enough to bring out the daredevil kayakers, but still pretty amazing to watch. 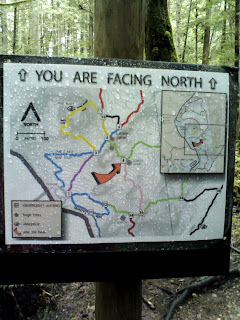 There are two viewing points at the end of the trail and a fork in the trail with about 10 minutes left in the hike. Roland Point is where you want to watch the incoming tide for rapids. North Point is where you want to watch whirlpools at ebb tide. There is a large rocky outcrop at Roland Point…the perfect spot to rest after your 4km hike. Bring a light lunch, drink some water and take some photos of this natural wonder. Enjoy the show. If this isn’t reward enough after a great hike, take a few minutes to stop by the Egmont Heritage Centre across the road from the entrance. My favourite post-hike activity is a delicious meal overlooking the inlet at either Backeddy Pub or West Coast Wilderness Lodge…both only 5 minutes away. It has been a gorgeous week for getting outside. 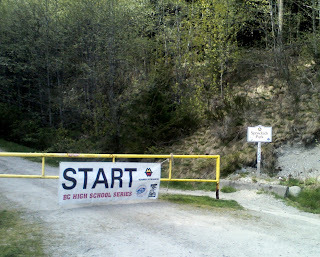 Wednesday, Sprockids Mountain Bike Park was home to the North Shore League Mountain Bike Series. Some friends were helping to organize the race, so I stopped by to give a hand (and enjoy the sunshine). Over 100 students were on the Coast to test themselves. I have to say that it was a pretty cool event to watch. Like cross country running, you really can’t watch the entire race. 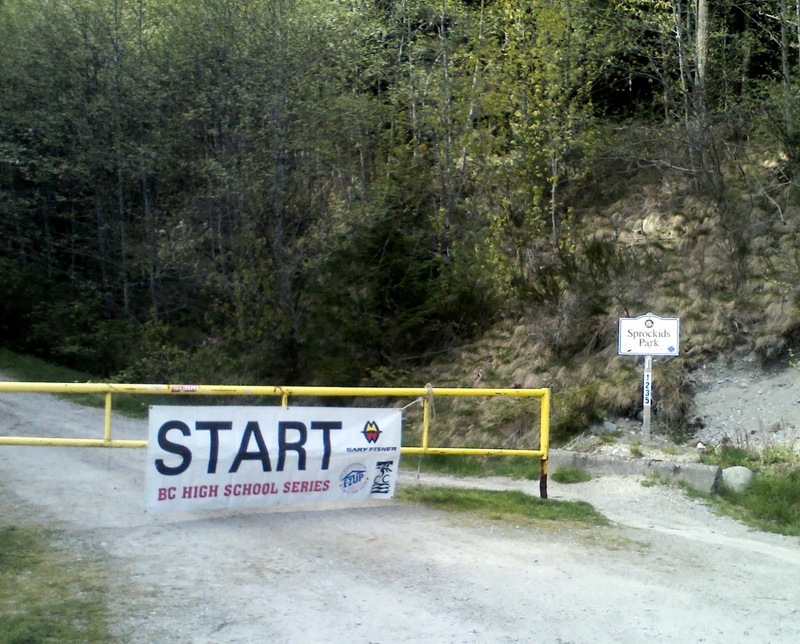 The course was set up on some of the easier trails near the bottom of the park, but older students had to ride additional laps of the course. Some students were very series and focused…immediately wanting to know where they placed. Some students fist-pumped as they finished, proud of their ride. For others, just finishing the course was an achievement and even though they were exhausted for a few minutes, the pride of conquering the course was clear on their faces. Today with all the students gone, I decided to hike much of the race course. The first leg went down Ankle Biter and over to Stinger on the south edge of the park. 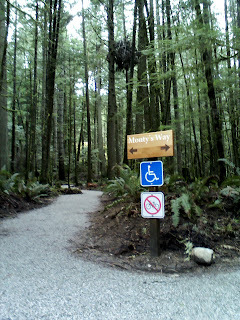 I must have never gone all the way along this trail, because look what I found. Isn’t this the cutest picnic spot? The birds were singing on such a nice spring day. This picture is along Stinger. It was nice to hike along trails I haven’t done in a while: Rock n Root, Skoolz Out, Technical Ecstacy. 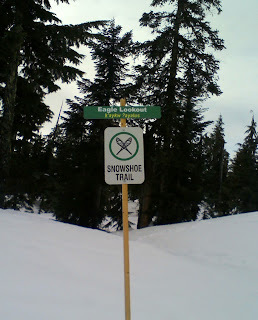 It was also fun to see all the new signs throughout the trails that were installed last month. They don’t all have their “you are here” dots installed, but it really helps when navigating this extensive trail network. 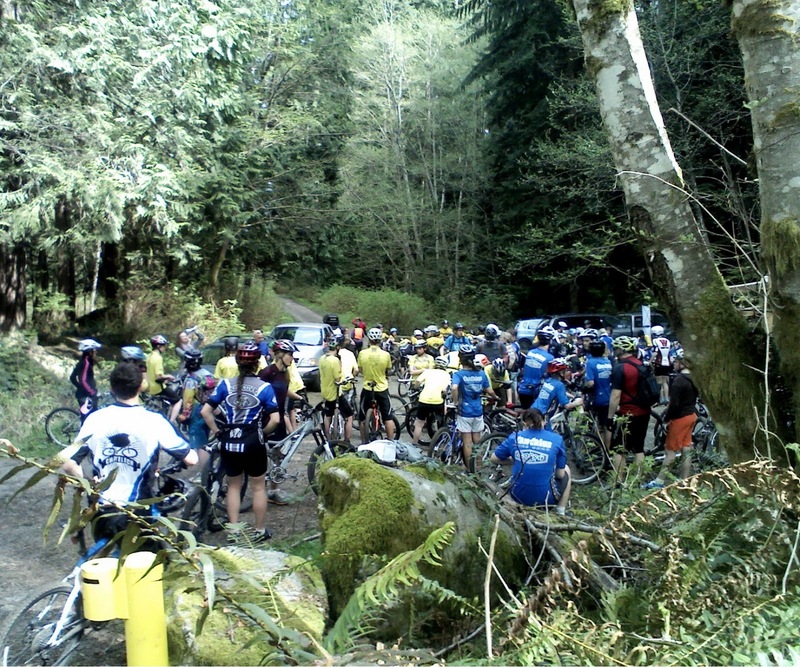 Can’t wait to find the new trail being created right now by the Capilano University Mountain Bike Program students. They’ve been working hard this month and if previous projects are any indication, this new trail will be great. Today was a day to celebrate community volunteers. Sprockids Mountain Bike Park is a place I’ve written about a lot. 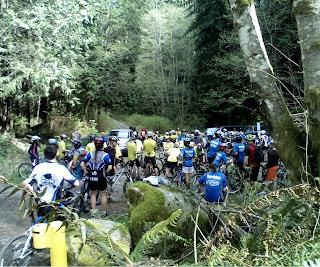 Last year it celebrated its 20th anniversary sharing our amazing forests with kids through the love of mountain biking. Teaching kids to ride safely with family and friends in a sanctioned park with educational components. This system is now used across Canada. Here it is 2km from my front door and I place where I love to hike. Capilano University’s Mountain Bike Operations students organized the day to install over 30 signs throughout the park. Students, families and some diehard trail fairies spent the morning digging and carrying signs. Never get lost again! I’ve often been hesitant to direct guests to this park because of limited signage and maps in a complex system of trails making it an easy place to become disoriented. 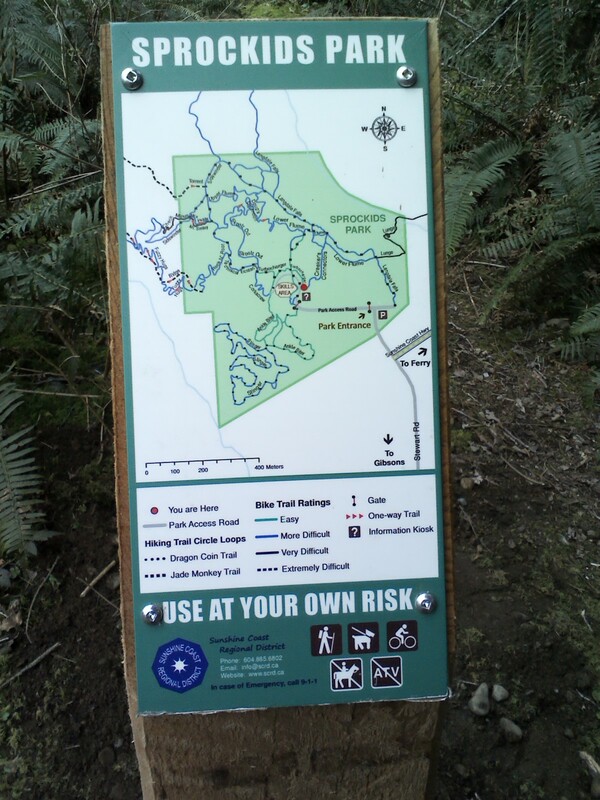 This is a great addition and will be very helpful to hikers and bikers alike. I would love to see someone bank on this. That boulder at the end of the jump is taller than me! As I hiked, I could here some bikers above me. I decided to wait and see what is was like to jump off this. I expected someone to just launch over it and fly down the trail. Turns out, all these jumps and bridges are great teachers and confidence builders. Three young teenagers rode down and all came to a stop either beside or on top of this jump. They studied it…rode past it to check the landing…and discussed. Three different times one of them would ride up to jump it and stop at the last minute…not ready for the leap…talking to themselves that it was about being there mentally. Finally one of them did it, and they all celebrated for a minute. A brief pause before taking off together to find the next challenge. I finished my hike just in time for the skills demonstration. After a morning of digging holes to install signs, the kids were treated to a free lunch from the Lions Club burger trailer. Then they hit the skills park for some serious jumps from Coastal Crew and friends. They were flying…25 feet off the ground. Sorry, no good pictures, but they were impressive. The really fun part was after one of the older kids would jump, an eager 4-8 year old would ride from the same starting point and off to the next small run with a couple of junior size berms. The little guys were just as thrilled to show off in front of the audience and just as proud to ride successfully. The older guys cheered them on as much as they did for their friends making the huge jumps. What a great day. Hello Spring! To celebrate, I managed to take time for my first hike in the forest in a month. Boy did it feel good! Holiday, March rains, and a cold have kept me off the trails. 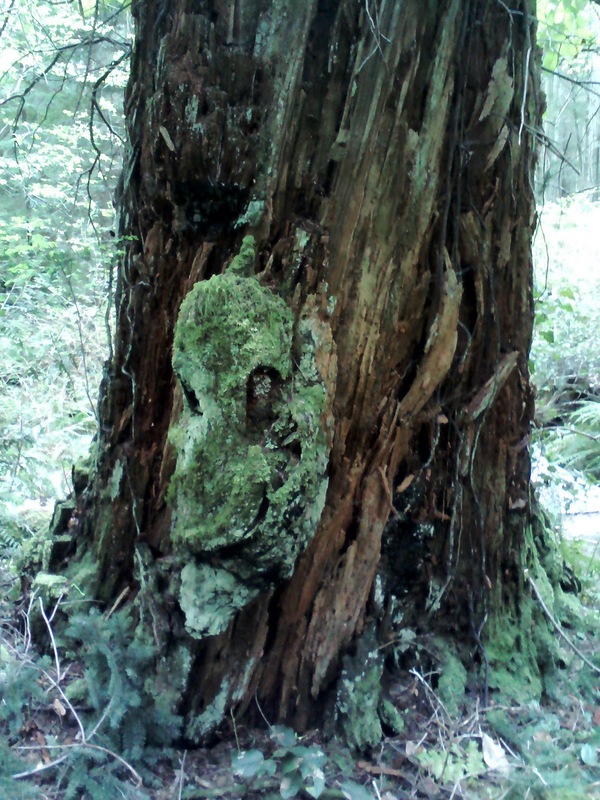 I made time to explore Hidden Groves on Sechelt Inlet. I’ve only hiked here a couple of times and it seemed like a good day to explore. 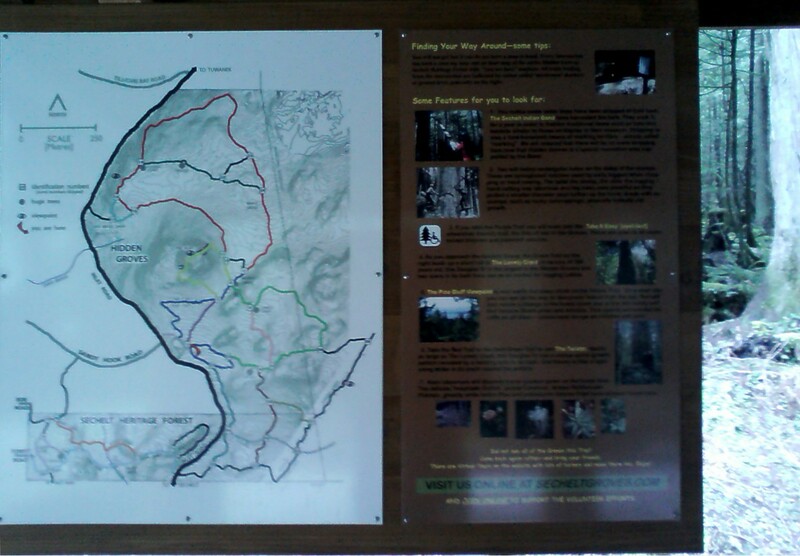 The volunteers who have developed this park have done an enormous amount of work to create not only trails, but informational maps and signage. No worries about getting lost here…maps can be found throughout the trail system. They’ve even marked and named the largest, oldest trees to be sure you don’t miss them. Too bad I didn’t have a friend along so that you could see just how big this Lonely Giant is. The young trees are as skinny as a man’s arm. 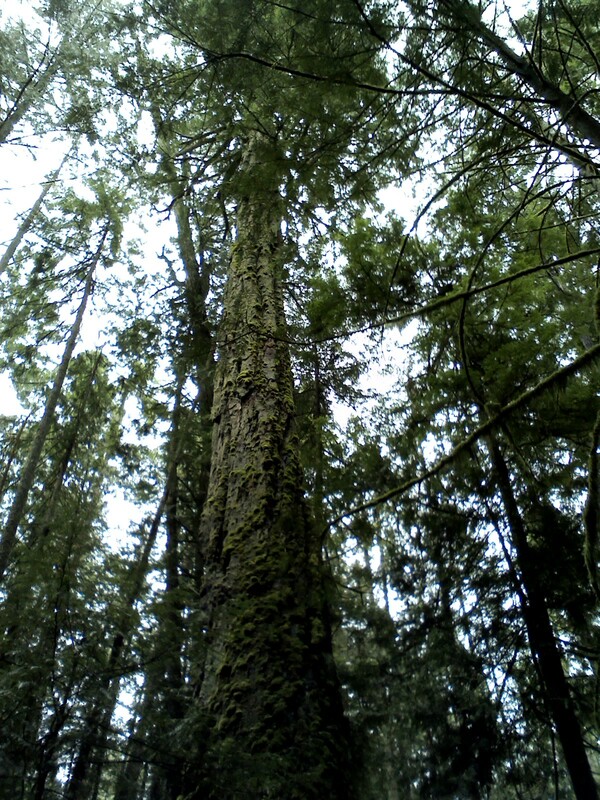 Lonely Giant towers over the others and would take a group with arms outstretched to reach around it. I covered most of the southern half of the park in about an hour. These are easy trails with no serious climbing. The ground can be uneven in places, but the terrain is mostly flat with only gradual elevation changes. 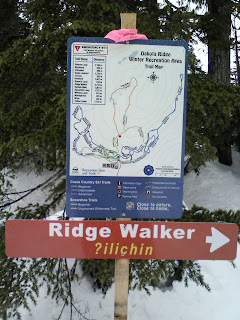 I look forward to my next trip where I’ll explore the north side where there the maps show some steep climbs up to an amazing view of Vancouver Island. The trail builders have been busy. 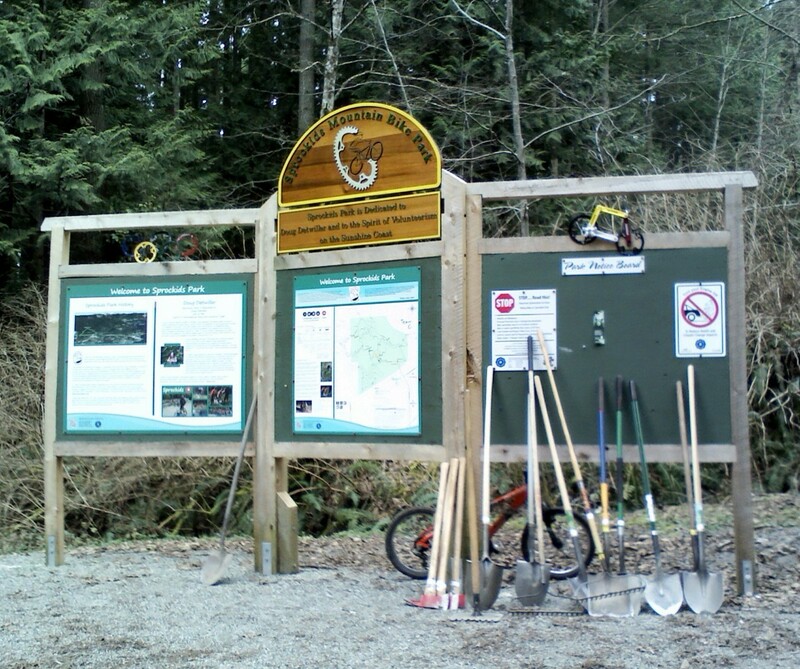 The official grand opening of the second wheelchair accessible trail is Sunday April 7. It is a special celebration for dogs and people of all capabilities. You know how sometimes you just want to be out on your own with time to think? Today was one of those days. 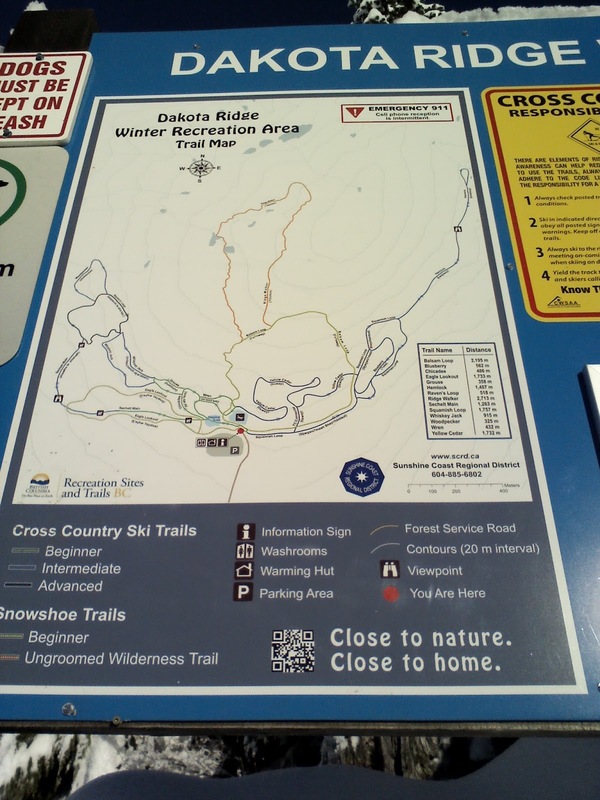 With the promise of sun, I grabbed my snowshoes and caught the Alpha Adventures shuttle to Dakota Ridge Winter Recreation Area. 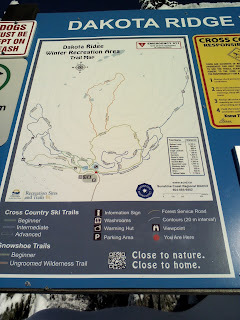 Even though I arrived at Dakota Ridge with 15 other people in the shuttle and there were quite a few skiers near the parking lot and the warming hut, I had the trails to myself. All the trails are now signed and have been well marked, so after of couple of times of hiking with other people I have no problem venturing out on my own. 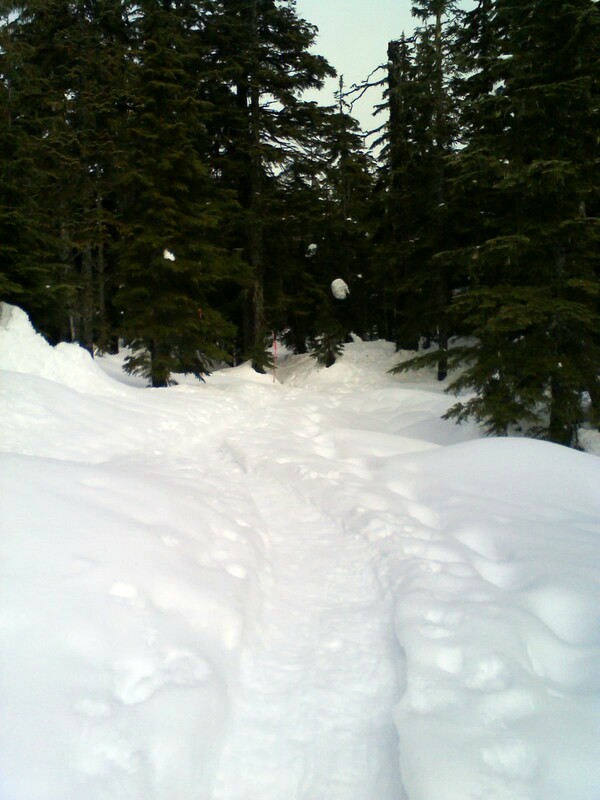 I take care, one could easily get lost in the white snowy forest if you left the trails, to ensure I stay on the marked trails…letting the alone time be adventure in itself. I hiked the almost 2km Eagle Lookout trail without seeing another soul. Dakota Ridge had a ton of snow in December. The base was up to almost 3 meters. 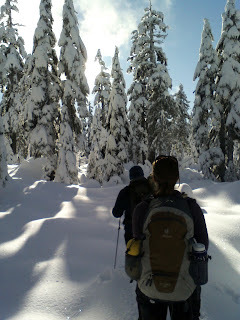 When we were there on Boxing Day, all the trees looked like white Dr Seuss candy canes. Today the trees were green as we’ve had warmer temperatures lately that have melted some of the snow. 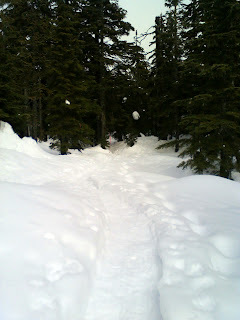 The snowshoe trails are obvious with hard tracks to follow. Fresh snow in this week’s forecast should cover that up with fresh powder. 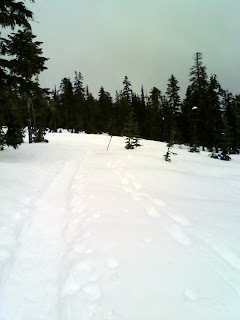 After a short snack break outside the warming hut, I headed out on the Balsam Loop. This is another green trail just over 2km long that starts and ends at the warming hut. The first half of the trail meanders through the forest, but there is a point where you come over a hill and into a clearing where on a sunny day there are just amazing views. Today the sun was playing peekaboo most of the day. There were touches of blue sky and warm sun, but clouds kept hanging in. The view is still pretty awesome. Check out my December post if you want to see the clear sky pictures. It wasn’t until the very last leg of the trail that I passed 2 groups that I had ridden up with in the shuttle. Almost 4km of snowshoeing completely alone with my thoughts…great exercise and productive brainstorming. When I finished, I had a nice break in the sun at the warming hut. I was able to visit with someone who was waiting for the rest of his party. Dakota was well used today. A dad/daughter learning how to cross country ski, a large group of co-workers on a team building day, a husband/wife team on their first snowshoe adventure, screams of joy from the tobogganing area, and just as we were leaving a boy scout troop on a winter camping adventure. 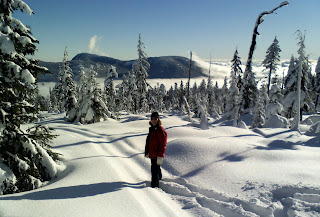 I am sure I won’t let another month go by before my next snowshoe. It may be another week until the official start of winter, but today we enjoyed our first day of fun in the snow. 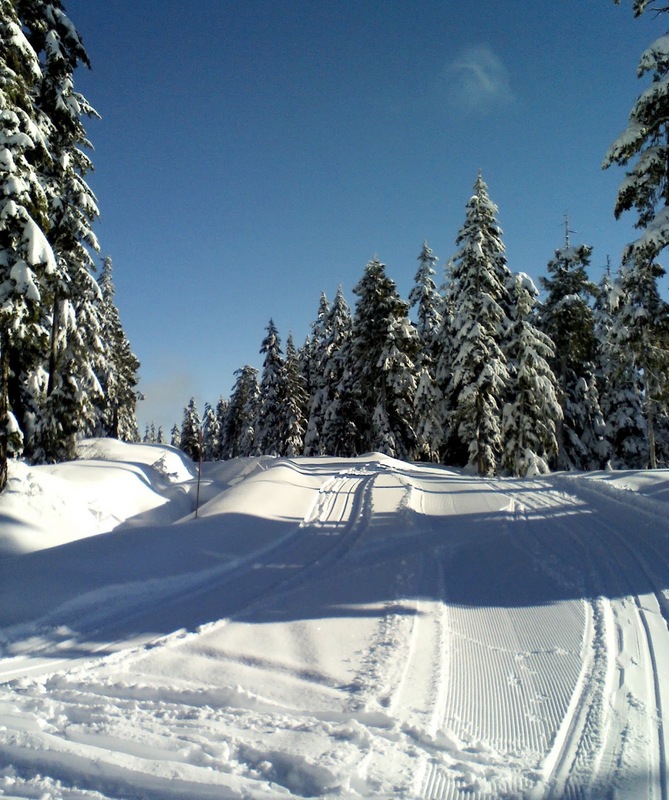 Saturday, December 15 is the official season opening for Dakota Ridge Winter Recreation Area. 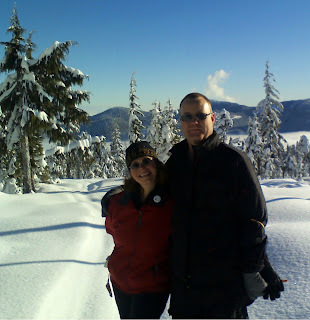 Our good friends at Alpha Adventures took us out for a sneak peak & guided snowshoe tour. It was an AMAZING day! You couldn’t ask for better weather conditions. It is early in the season, but new snowfall was 50cm (that’s 20 inches) in the past 24 hours. The clouds broke overnight and the sun was shining this morning. Temps were just around the freezing level. We were warm after a bit of hiking and the snow on the trees was just melting a bit in direct sunshine. 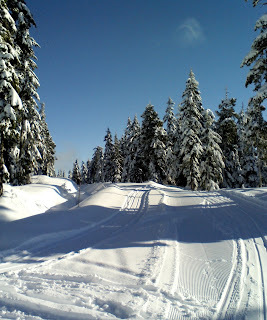 A perfect bluebird day. 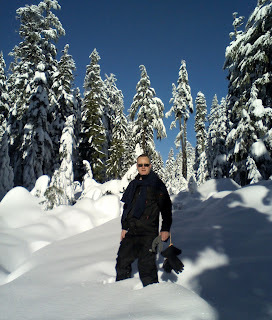 Knee deep in fresh powder! 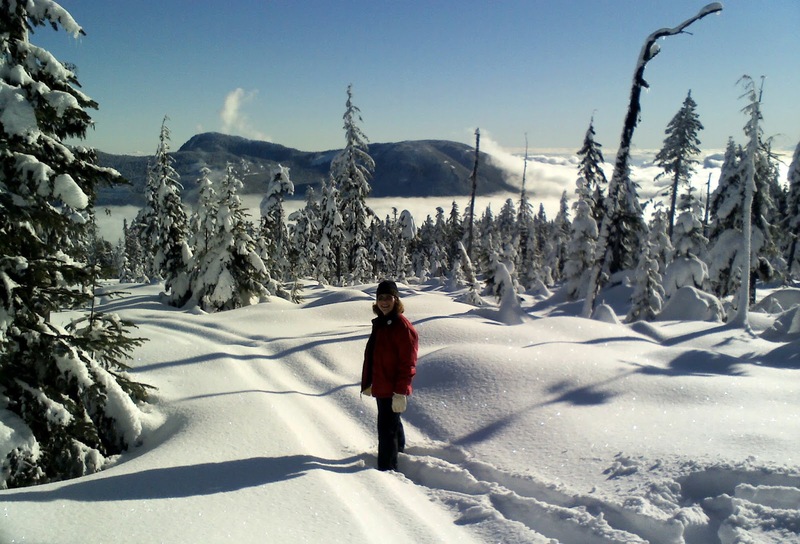 Dakota Ridge has almost 4km of groomed snowshoe trails and another 3km of wilderness trails. With our expert guides, we were able to get off the beaten path (though in all that powder…not so beaten) and break fresh tracks through the forest. 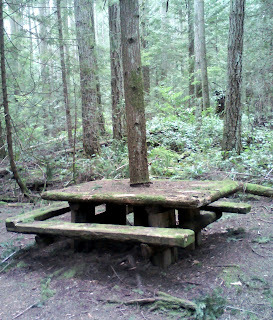 The forest is magical….so very quiet. Snow makes the most interesting shapes covering varied terrain, small trees, and moved by the wind. It was a bit like a Dr Seuss picture with rounded magical shapes. Alpha Adventures offers guided trips and lessons for both cross country skiing and snowshoeing. They also operate a convenient shuttle from Wilson Creek up the mountain roads to Dakota Ridge. The access road is much improved this year thanks to a provincial grant. The road is wider and has more pullouts, but it still requires chains or 4×4. My little VW isn’t making that trip, so I am more than happy to ride in Alpha’s comfortable shuttle. The parking lot has doubled in size, so there is more room for everyone making the trip. We hiked quite a distance without seeing another sole…partly because this was the day before opening day, but these trails are never crowded. Plenty of room to get away from it all and just enjoy exploring on your own. Coming down over the Eastern trails, we found the most amazing view. We could see the North Shore Mountains, including Cypress and The Lions. There were low level clouds & fog blocking the view of the ocean, but we were so far above the thick clouds that they looked like a big fluffy ocean. It was the perfect spot to stop, take a few pictures and have a snack. Just an amazing 360 degree view. After a full day of snowshoeing we stopped in the warming hut for lunch and hot chocolate. A much needed rest at the end of a great day. 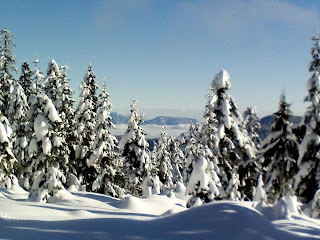 I can’t wait to get back up on Dakota Ridge…thinking a great way to spend Christmas Day.